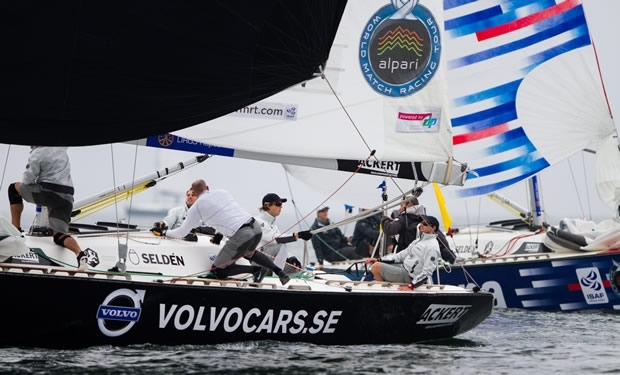 With Taylor Canfield and Alpari World Match Racing Tour leader Mathieu Richard failing to make the grade at the end of Qualifying, there was further upset today in the Quarter-Final rounds of Stena Match Cup Sweden. Defending Tour champion Ian Williams and his GAC Pindar crew were trounced 1-3 by Keith Swinton’s Black Swan Racing, despite the young Australian skipper having only just scraped his way into the Quarter-Finals yesterday. Racing went to the full five matches (first to three points) between Bjorn Hansen’s eWork Sailing Team and Adam Minoprio’s Team Alpari FX, with the Swede ultimately coming out on top. With both Minoprio and Williams out, Stena Match Cup Sweden is suffering from a dose of the Wimbledons, with all of the present top four from the Alpari World Match Racing Tour leaderboard now out of the competition and having to reschedule their travel home. Particularly impressive was the Hansen-Minoprio match when Hansen performed an Andy Murray-style comeback from 0-2 down. The Swedish skipper pulled back from the brink, bringing the score to 1-2, but seemed to have been roundly defeated in the pre-start of the fourth match. First he was penalised for failing to enter the starting area properly and then had to restart after he was over early at the gun. “I put us in a fairly stupid situation at the start to be honest,” Hansen admitted. As he couldn’t see the committee boat at the start he took longer than normal to return and restart, by which time he was eight boatlengths behind. However fate smiled on the Swedish team on the first downwind leg. As Hansen recounted: “The wind filled in from behind. First we took Adam [Minoprio] on a port-starboard and then, gybing on the layline to the mark, we rolled over him.” The Swedish team then defended well to even the score 2-2. After a mid-afternoon break to allow a race to take place, in which all the boats were crewed by the Swedish stars of sport and the stage, Hansen won the final decider to earn his berth in tomorrow’s semi-finals. A bigger upset to the pecking order was Ian Williams falling to Keith Swinton. Williams’ GAC Pindar crew got off to a solid start, winning the first race, but Swinton, the 27-year-old Aussie skipper, won the next three. The two other Quarter-Final matches also went the full way with New Zealand’s Phil Robertson and his WAKA Racing winning the decider against local hero Johnie Berntsson and his Stena Sailing Team. Similarly Italian Simone Ferrarese and his Ferrarese Racing Team, winner of Qualifying, went to five races against Finland’s Staffan Lindberg and his Alandia Sailing Team, with Ferrarese coming out on top. Racing continues tomorrow with the semi-finals at around 1100 UTC. Simone Ferrarese has chosen to race Bjorn Hansen, leaving Phil Robertson to line up with Swinton, winner of this year’s Congressional Cup. Live streaming of the racing starts at 1100 UTC (1300 local time) tomorrow.